We Nigerians in diaspora have to learn how to use what we have to get what we want. We long for Nigerian food, but many times, getting Nigerian foodstuff can be nose-racking. We are either challenged by availability, accessibility, cost or quality. Instead of ugu (pumpkin) leaves, you will have to make do with spinach as fresh ugu is very rare. More so, the ground crayfish you will buy here will be nothing compared to crayfish in Nigeria. The process of packaging it for commerce makes it lose its real taste. So you have all these challenges plus the fact that you can't afford to spend all your time in the kitchen boiling shaki (beef tripe) and kpomo (cowskin). And yet you can't be eating sandwiches every day. Well, just maybe there is a way to make your soup with the least requirements and still have it tasting as nice. I'm about to show you that with Okra soup. The basic ingredients in every Nigerian soup are palm oil, pepper, fish (crayfish/stock fish/dry fish/smoked fish/fresh fish) and meat. The major difference between the soups are the types of leaves used. Even if the only fish you can get is ground crayfish, your soup will taste as nice as made in Nigeria. 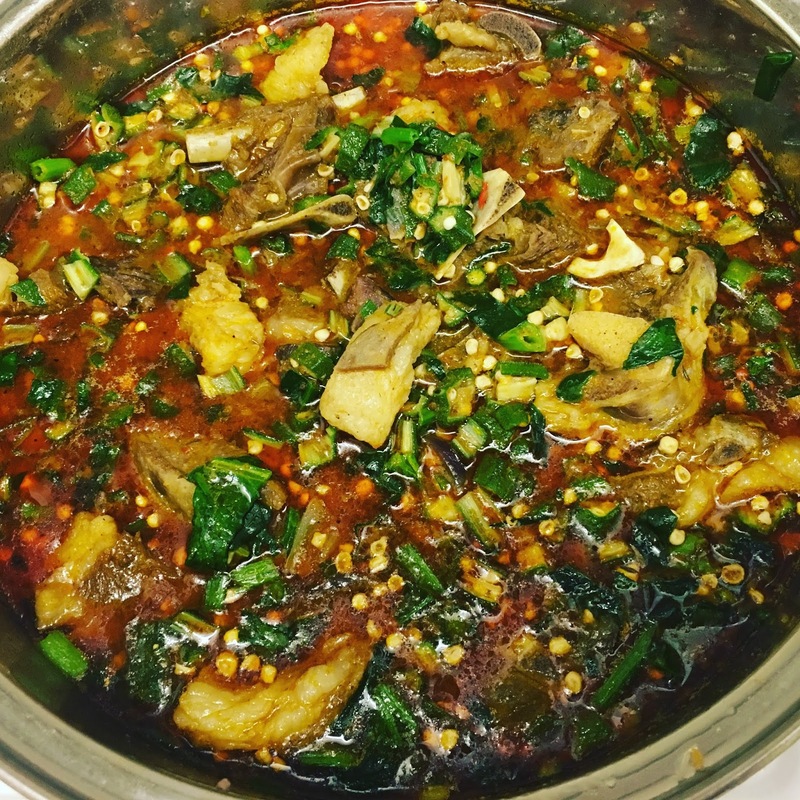 Here is a list of the ingredients you will be needing to make your Nigerian okra soup. 1. Boil your meat with onions, salt, garlic, ginger and seasoning cube. 2. Cut your pepper and onions. Chop your vegetables (spinach will do) and dice your okra. 3. Place your diced okra in a bowl and stir it for 5 mins or till you see it drawing, and set aside. 4. Place an empty pot on the fire, pour a little palm oil, put your onions and cut peppers, fry for 2 minutes. 5. Add the meat and stock, ground crayfish, ground chilli and simmer for 2 minutes. 7. Add the okra, stir, cover and allow to simmer for 2 minutes. 8. Add chopped spinach. Not too much spinach though, as this is okra soup and not spinach soup. Too much spinach makes the soup watery. The essence of okra soup is that it should draw. So spinach should be minimal. Also, the smaller you cut your okra, the greater potential it has to draw. Some even grate it, but I find it too stressful to do. 9. Simmer for 30 secs and turn off the heat. Voila! Food is ready to be served with any starch- Garri, Semolina, Poundo yam, Oatmeal, Ugali etc which you can also get from the A/A/C shops. Who said you can't eat Nigerian food in the UK? Lemme hear your thoughts. How do you eke out a good Nigerian meal with minimal resources?